Oscar's not ready to begin a new week, either. But there's a big difference between being a rabbit and being a human...the human must get out of bed. 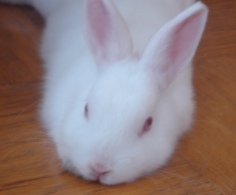 Spoiled little rabbits like Oscar can just go on and sleep the day away, while his human runs around getting fresh food and water for him, cleans his litter box, and gets ready for a full day of work. Ah, what I wouldn't give to be cute and cuddly for a day. But Oscar's human had the foresight to make a little pick-me-up this morning. They almost make her forget that it's Monday. Almost. A few ingredients go a long way with these buttery little thumbprint cookies. While the glaze isn't an essential addition to the cookie, it brings out the almond flavor from the background, and makes for a pretty presentation. 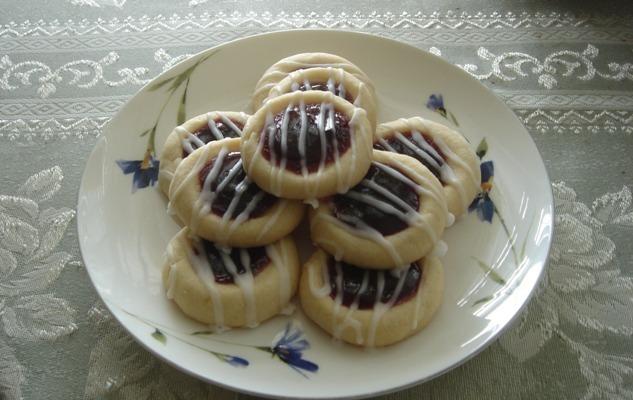 Although I'm very fond of the combination of raspberry and almond, you can fill these cookies with any of your favorite fruit jams. Apricot works well; so does cherry. In a large bowl, cream butter with sugar until light and fluffy. Beat in the almond extract. Gradually mix in the flour until the dough just comes together. Roll dough into 1 inch balls, placing them 1 inch apart on an ungreased baking sheet. Using your thumb or the back of a wooden spoon, gently make an indentation in the center of each dough ball. Fill with raspberry jam. 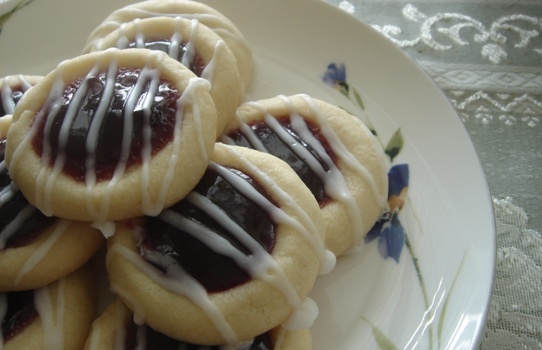 Note: be careful not to over-fill, as the jam may bubble over as the cookies bake. Bake for 14-18 minutes, until the edges of the cookies are golden. If desired, top off the filling with a bit more raspberry jam. Allow cookies to cool completely on the sheets. Mix the powdered sugar, almond extract, and water to make the glaze. Spoon glaze over cookies, creating a zig-zag pattern. Allow glaze to set. 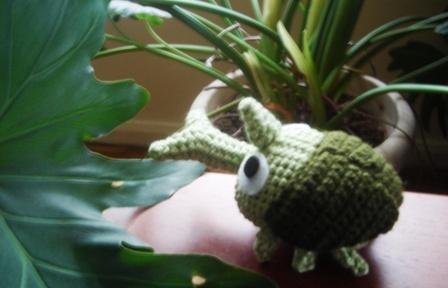 I've just realized that I haven't posted a stuffie in a while...the truth is, I haven't been making as many of them as I used to, mostly because I'm running out of places to put them. New York apartments aren't exactly roomy, and stuffed toys (both purchased and handmade) have long ago taken over the place. So I've been trying to resist the urge to make toys left and right, and to try and focus on crafting items that have a bit more utility...like bags and clothing. But sometimes, you see, I just can't resist. Behold. Simon's a kabuto mushi, or horned beetle. Although the instructions are in Japanese, charts are included, so the pattern is very easy to follow. 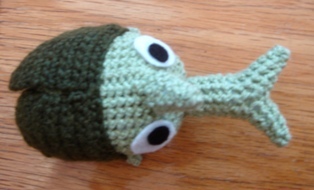 He's a bug, and for once, I'm not completely grossed out. Why, I'd even say that he's cute. But don't tell him that, because he'll get a big head. I mean, look at him! 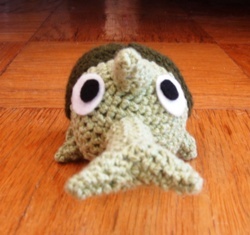 Seeing him scuttling across the floor makes me squeal. Not in fear, mind you, but in delight. But Simon's a macho guy. He'd like me to show you his big horns. So even though he may look sweet, the guy can put up a good fight. Or so he says. Although he has incredibly good looks and a very manly phisique, overall, Simon's just a mellow, easy-going guy. He likes long walks, hanging out on wooden surfaces, and just chillin'. Any she-beetle's out there interested in a date? ... ... ... No? Didn't think so, but Simon insisted that I ask. After all, stuffed beetles can be extremely intimidating. Especially if they have horns. I recently attended a baby shower for someone who was expecting a little girl...I've been so busy lately that I completely forgot about posting the gift that I made. 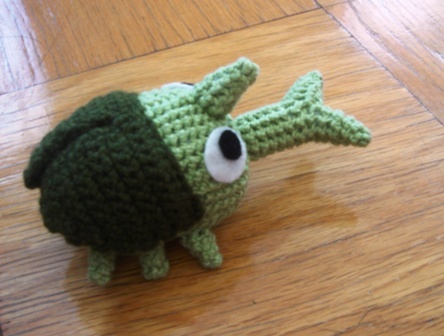 I had seen this wonderful idea (and free pattern!) 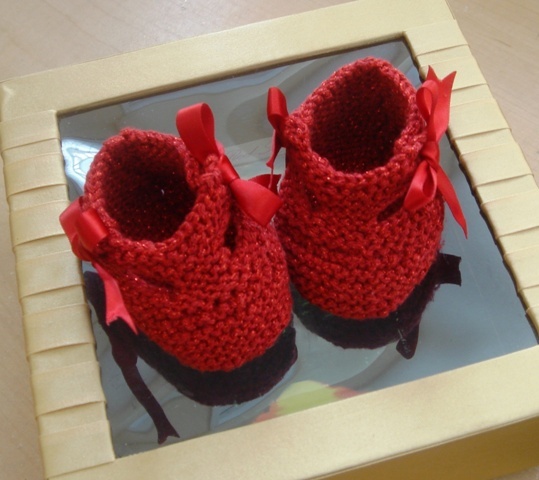 more than a year ago, and promised myself that I would knit up a pair of glittering red booties for a special baby girl some day. That day finally came. I was not able to purchase the Lion Brand Glitterspun yarn called for in the pattern; I used Paton's Brilliant instead, and modified the pattern for the lighter weight of the yarn, using size 3 needles instead of size 7 and adjusting the gauge. Instead of using buttons, I attached red satin ribbon to the booties and tied them in bows to hold the t-straps in place. Although I made a couple of minor changes, the booties were still a quick knit, so I found myself with some spare time to work on the presentation of the booties. I wanted the recipient to be able to display the booties after her daughter outgrows them, so I decided to decorate the box accordingly. I found the picture for the background online; someone had adjusted a photograph so that the road became golden-colored. I used Photoshop to adjust the hues and contrast a little more, and also edited out some poles along the side of the road. I cropped the image so that it would cover the bottom of my box, and then started working on a card. The card is pretty much covered up in most of the photographs, so I've uploaded the file I created. After printing this image, I signed my name in red and glued the card into the box. 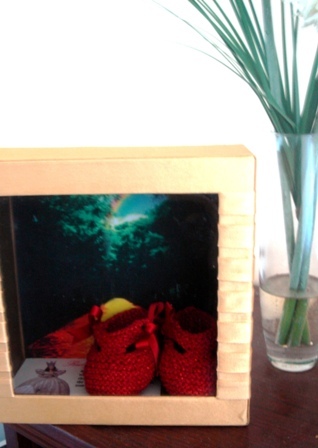 Speaking of the box, there couldn't have been a more perfect box for my vision of the booties display. The box is covered with gold-toned ribbon, and has a see-through window in front...I squealed out loud when I found it in my stash of gift boxes. Tada! 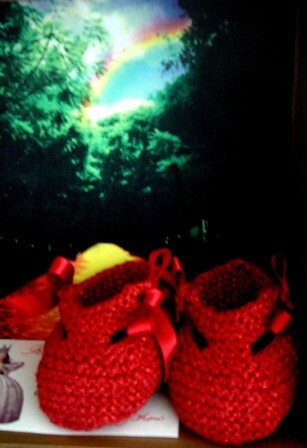 A Wizard of Oz display for the Ruby Red Booties. If it wasn't for the fact that I wasn't pregnant, and won't be for at least a few more years, I would most definitely have been unable to overcome the temptation to stash away these booties for the daughter that I might have someday. But I was able to find it in myself to part with the booties and bring them to the baby shower. Upon unwrapping my gift and seeing the booties, the look on the mom-to-be's face made my "sacrifice" worth it, many times over.